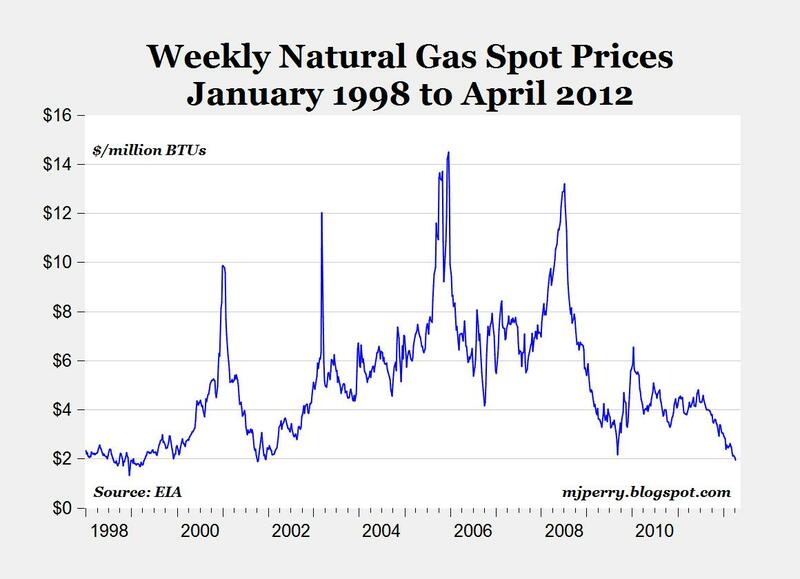 CARPE DIEM: Spot Natural Gas Prices Fall Below $2, Might Be Lowest Inflation-Adjusted Price in U.S. History? 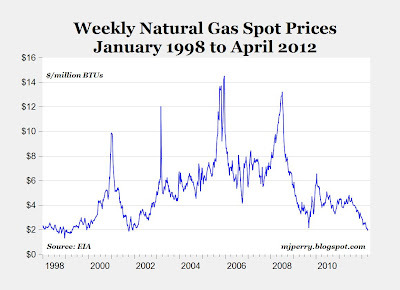 The spot price of natural gas fell below $2 per million BTUs this week, reaching lows not seen since 2001 in nominal terms (see chart above, data here). When adjusted for inflation, the $1.88 spot price on Monday could likely have established a new all-time record low for natural gas (EIA data only go back to 1997). Some industry analysts expect prices to fall even lower in the coming months, due to the strong supplies and weak weather-related demand, possibly as low as $1? I agree with Rufus II. Economic forces are building-up to where supply decreases and demand increases. It may be depressed for several more months. However, something like UNG or UNL are likely excellent long-term buys. So, will speculators continue to drive the price lower or begin to drive the price higher? Russia is the #2 producer behind the U.S. in natural gas production. What has been the price story for Russian gas at the German border since 1998? Up 343%, and 33% for the last year. May 24 (Bloomberg) -- Parnon Energy Inc., an oil logistics company, and Arcadia Petroleum Ltd., a London-based oil trader, were sued by the U.S. Commodity Futures Trading Commission over claims they manipulated prices for oil and oil futures. Parnon and Arcadia, affiliated companies, allegedly manipulated the prices of West Texas Intermediate crude oil and derivatives based on that oil from late 2007 through April 2008 They lost money on the sale of the crude oil and gained more than $50 million on the derivatives, according to the complaint. Two individuals also named in the suit, James Dyer and Nicholas Wildgoose, directed derivatives trading for the enterprise, the agency said in its complaint filed today in U.S. court in Manhattan. They amassed a stockpile of crude oil in order to dominate supplies, then bought long and short positions in oil futures to make gains on the “artificial” rise in prices, according to the complaint. “The scheme artificially increased the price of crude oil physical, derivatives and other oil products in the United States and elsewhere,” the commission said in the complaint. The scheme ended when the traders learned the commission was investigating them, according to the court filing. The real economy has not recovered and demand is still very weak. While some of the fall in demand was a warm winter in the Northeast clearly the weakness in the real economy has had a major role. It did not help that shale producers were forced to keep drilling and losing money. Once they are out of the way you will not see much drilling in the shale areas until prices are well over $10 due to economic factors. Shale gas is not cheap and only works when some of the input costs are extremely low because of the negative return in energy. Ahh, those evil speculators again. Speculators are usually responsible for reducing volatility but in this case there are very interesting conditions because of the lease conditions that are forcing shale producers to keep drilling when storage is full and demand is low. The trends will end when speculators stop lending money or buying newly issues shares by producers that are technically bankrupt and when the drilling activity falls to levels that make economic sense. The Russians have been able to sell their gas at a much higher price. The cold 2011/2012 winter has certainly helped increase demand even as the economic activity in the EU has collapsed. The Russians have not been chewing through capital on money losing shale production. Given the tighter supply of credit in the EU EU and Russian companies will have a hard time repeating the error made by the US shale producers. Yes Benji. We have those evil speculators to blame for cheap natural gas. You really can't be this stupid. Can you?